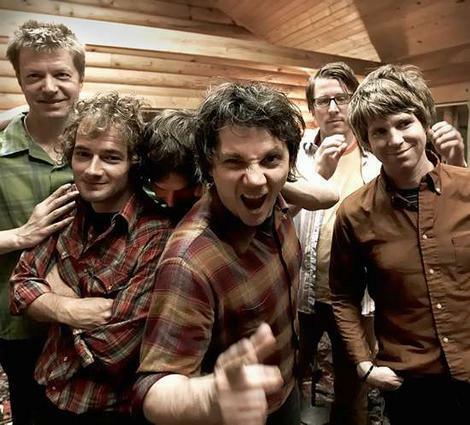 MADISON, Wis. — If reality-show cameras offered us unfettered access to the Thanksgiving dinner table of Chicago rock combo Wilco, we would probably hear “our devoted fans” listed among those that they’re most thankful for. That appreciation was evident during the band’s concert on Wednesday — Thanksgiving eve — at the Barrymore Theatre in Madison, Wis. The two-hour performance was a special show that gave the group an opportunity to pay back their fans for their loyalty. The timing of the concert was unexpected. The group’s multi-year tour wound down last month and the reason for re-starting Wilco’s engines again on Wednesday is a mystery. The band is reportedly recording its next album and the show might have been a warm-up for a two-night stand in the group’s homebase of Chicago during the long weekend. Tweedy and company charmed the adoring audience with renditions of old favorites, but the sextet also paid them the special compliment of previewing several new songs. Many of the new tracks have peppered the group’s shows in recent months, but a full quarter of the 22-song set was reserved for this night. It gave the band a friendly environment to both try out new material and offer an unusual glimpse of the creative birthing process. This idea was in the air as bassist John Stirratt’s first child was born only the night before. “We were up really late boiling water,” Tweedy joked, as he tried to explain away their rustiness. Life on the road seems to have intensified the group’s desire to enhance the songs with an orchestra of sounds, everything from an army of chimes to computer effects. The band has also steadily moved more in the direction of prog-rock with many songs featuring extended guitar workouts, raising the profile of guitarist Nels Cline considerably. Wilco has two multi-instrumental keyboardists, but Cline really changed the dimensions of the songs. He remade the glorious, former piano ditty “Theologians” into a slice of twin-guitar rock. Cline’s guttural slide guitar on “Kingpin” was as funky as the clavinet heard on the recorded version. Similarly, Cline’s lap steel playing expanded on the violin counter melody on “Jesus, Etc.,” making it one of the night’s clear highlights. Cline also took a number of extended solos. Each time, his hands would seize up and become rigid as he furiously scraped the strings. Tweedy demonstrated his own six-string adeptness at folk guitar with pristine plucking on “Muzzle of Bees” and spry chord changes on “Airline To Heaven.” The latter had the audience clapping in unison as Tweedy crooned the words of Woody Guthrie. Tweedy also took time to thank opening act, fellow Chicagoans Detholz!, by dedicating their excellent performance of “Late Greats,” a song eulogizing music’s unsung heroes. The quintet’s own half-hour set was infused with frenetic energy and unusual melodies that combined the keyboard whimsy of Styx (with less cheesy majesty), that familiar, insistent Coldplay drum pattern and high, two-part vocal harmonies. Perhaps out of familial concerns about the looming holiday, Wilco’s set ended a tad early at 10:35 p.m.
“John has to get home for the 2 a.m. feeding,” deadpanned Tweedy. It was clear by their fervent enthusiasm that the audience didn’t want to let the band go. They seemed to know that they were witnessing something special. While they were wowed by the group’s greatest hits, they also got a reminder on what they should be thankful for: Some new Wilco classics are about to be born. Tags: Barrymore Theatre, Chicago, Glenn Kotche, Jeff Tweedy, John Stirrat, Madison, Nels Cline, review, Wilco, Wisconsin. Bookmark the permalink.